Nourishing blend of rosehip oil and cranberry extract. 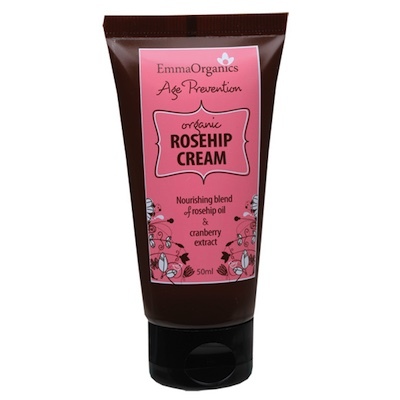 Emma Organics ROSEHIP CREAM uses the natural, anti-aging properties of organic rosehip oil for healing and repair and to help combat the signs of aging caused by harsh environmental factors. Organic Aloe Vera Juice, Purified Water, Organic Rosehip Oil, Organic Shea Butter, Organic Cocoa Butter, Cetearyl and Sorbitan Olivate, Tomato seed oil, Organic Guar Gum, Organic Lavender essential oil, Organic Ylang Ylang essential oil, Organic Bergamot essential oil (bergaptene free), Bitter Orange Extract, Citric Acid, Organic Olive Leaf Extract, Vitamin E Natural, Organic Cranberry extract, Organic Calendula Extract.